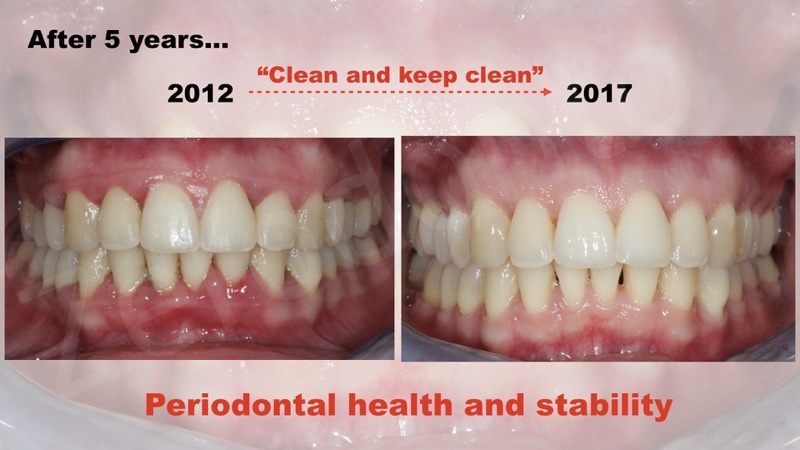 A 34 years patient, male, who was registered in our clinic for 10 years, came to our office for the regular 6-month interval check-up. 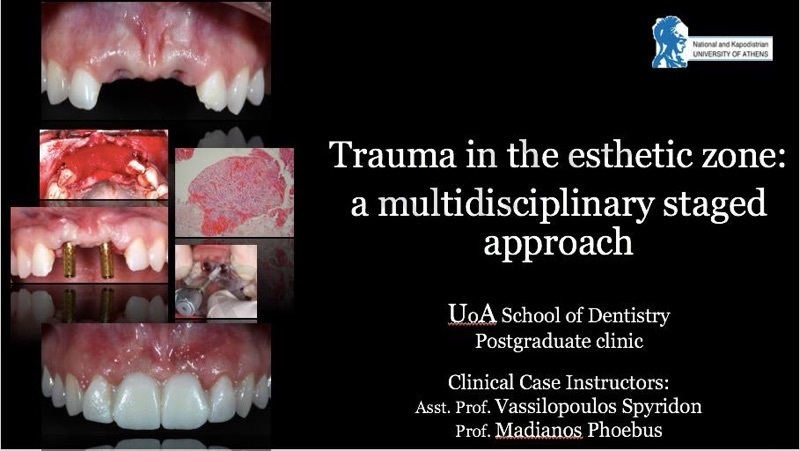 During a preliminary discussion, he complained of a”tooth mobility” that first occurred 3 month before, after a sport incident that caused a trauma in that region. As he had no serious pain, he assumed that everything would go back to normal after a while. Clinical control and cbct scan were performed. After analyzing both clinical (Fig. 1 – 3) and CBCT image data (Fig. 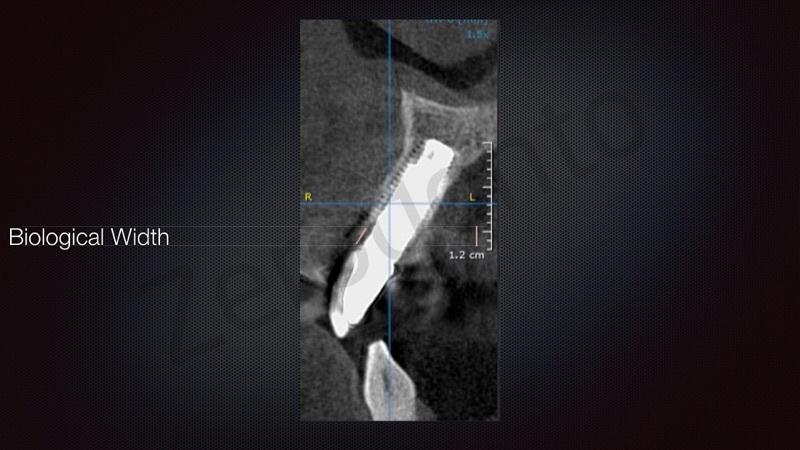 A – CBCT), the conclusion was that there was a root fracture at tooth 11, and, due to the root micro movement in the alveola together with the periodontal bacterial infiltration, the buccal bone was resorbed (type 2 class: soft tissue level virtually remained at the level of the adjacent teeth, bone lost almost up to the basilar bone). 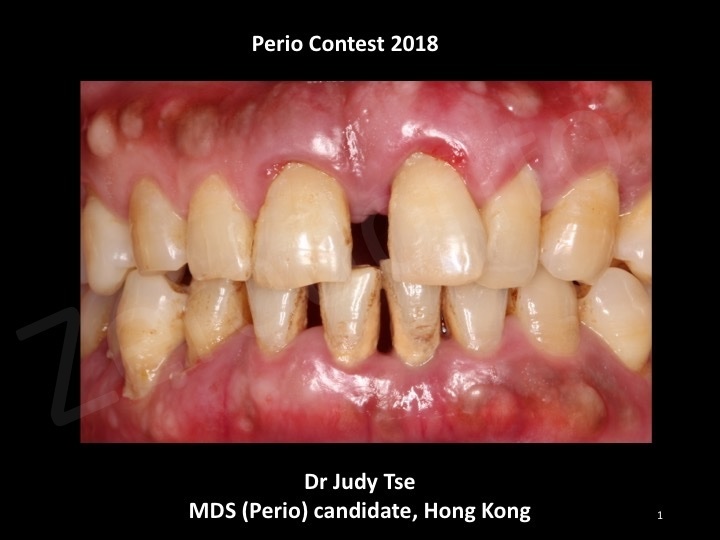 The patient’s file revealed that both upper central incisors were treated 6 years before (endodontic re-treatment, full ceramic crowns), with a good esthetic and functional outcome, being stable for the entire period since then. 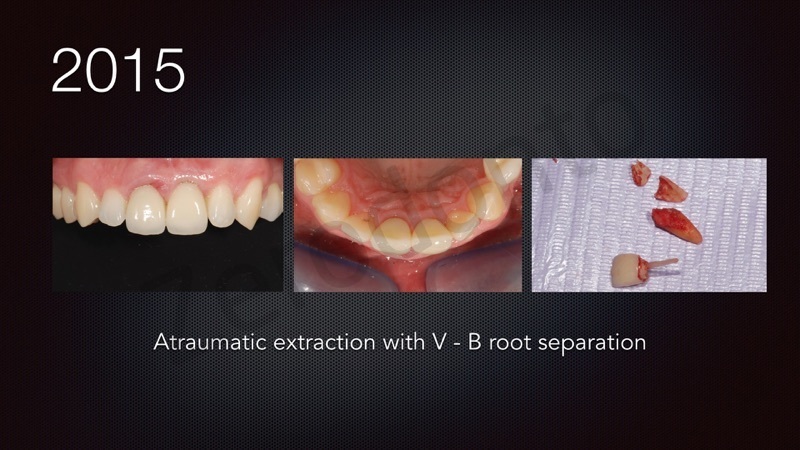 Interdisciplinary discussions with the endodontist concluded that the tooth 11 needed to be extracted, but for the tooth 21, there was still a chance for preserving it, without a new retreatment though (there was no sign of inflammation compared with the previous retreatment outcome and a high risk of root failure would have been possible on any new attempt of re-re-treatment). 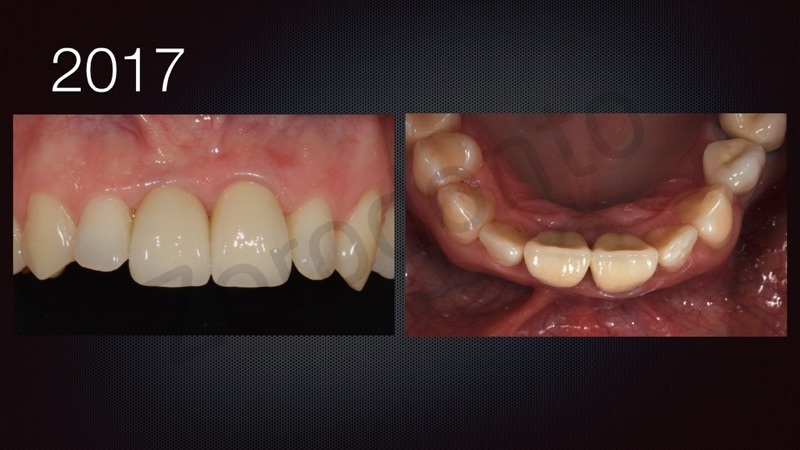 Clinical pictures and impressions for study cast models were performed, with the need of analyzing the possible zenith line outcome after the future surgical steps (extraction, implant) and the need of modifying the future crowns design of 11 and 21 for esthetic, functional and biological reasons. (Fig. 4). A “backward planning” treatment concept was applied in order to set the right planning strategy. The proposed treatment plan included the following steps: 1. 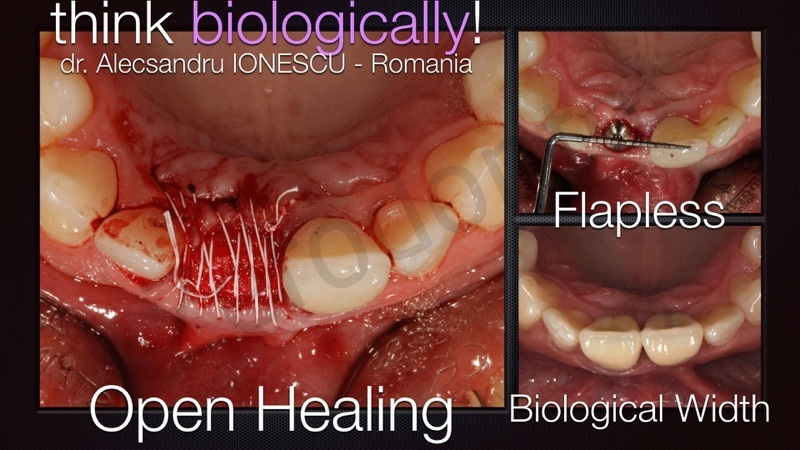 Tooth atraumatic extraction, socket preservation with the “open healing” concept; 2. 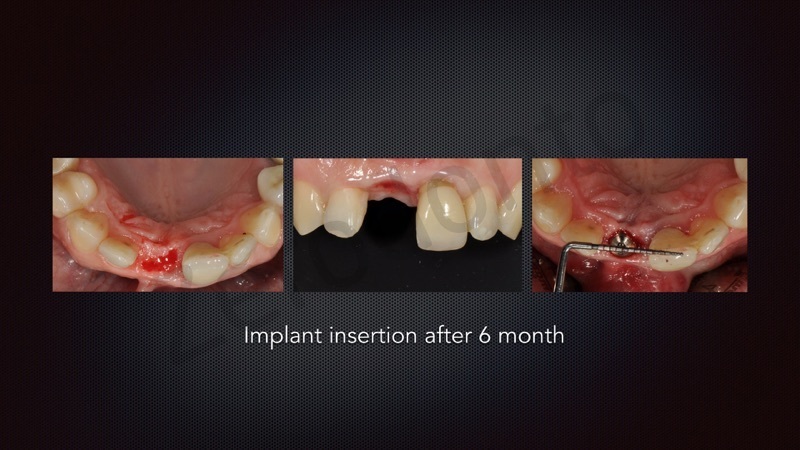 Delayed implant placement (6 month), flapless, using a soft tissue level implant; 3. 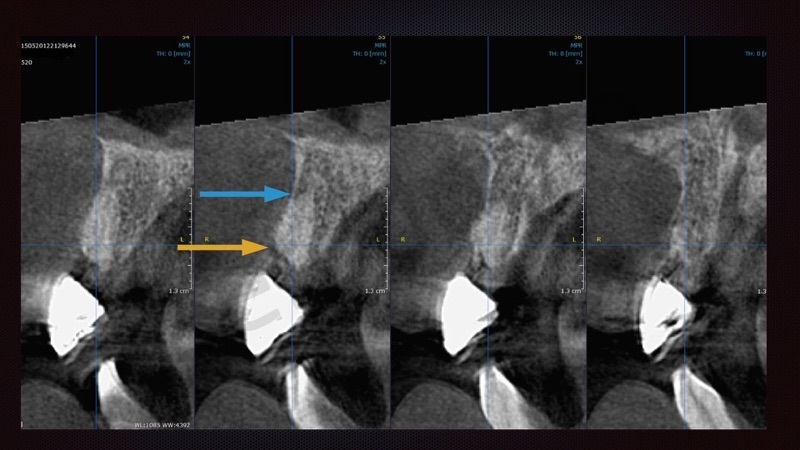 Clinical and x-ray evaluation after implant Osseo integration period (6 month), including the 3D structure of soft and hard tissue around the implant; 4. Final restorations. 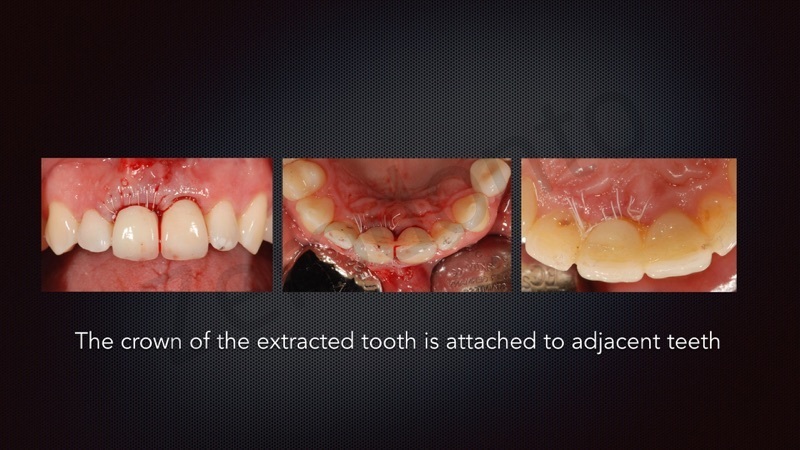 Atraumatic extraction. Socket preservation. Open healing. Tooth 11 was extracted atraumaticaly, socket preservation procedure was performed, respecting the “open healing protocol”. 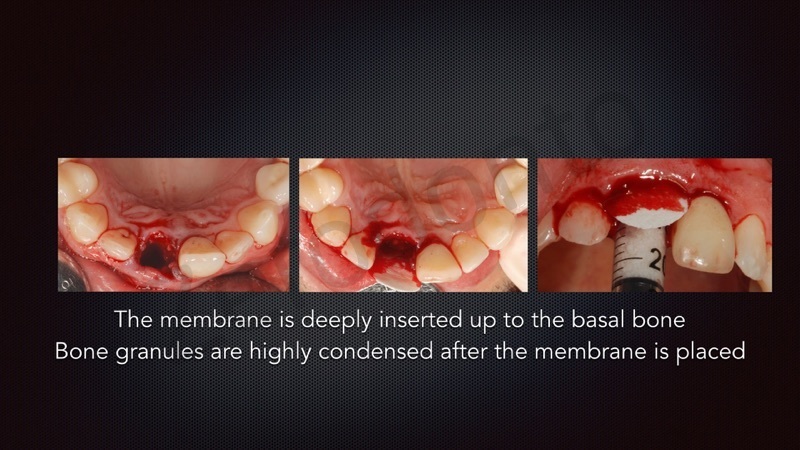 Bio-Oss, S (Geistlich, Switzerland) and Socket Repair Membrane (Zimmer-Biomet, USA) were used. 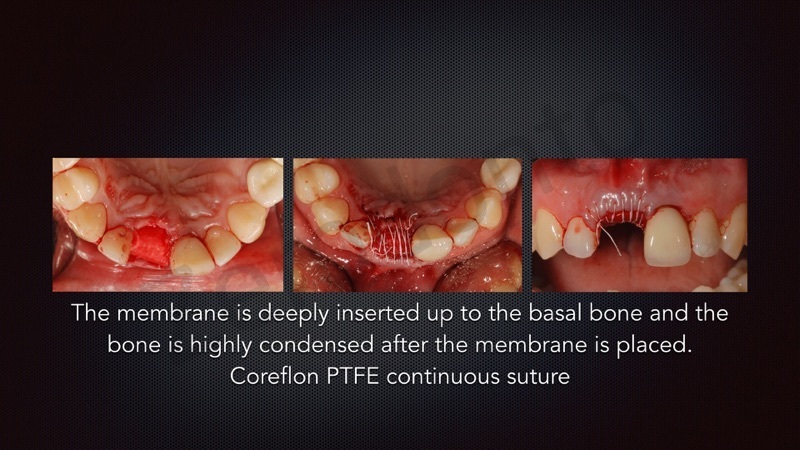 There was no flap raised, no periosteal incision, the membrane remained deliberately opened and a PTFE continuous suture at the free gingival margins (Coreflon, Poland) was performed to stabilize the membrane. 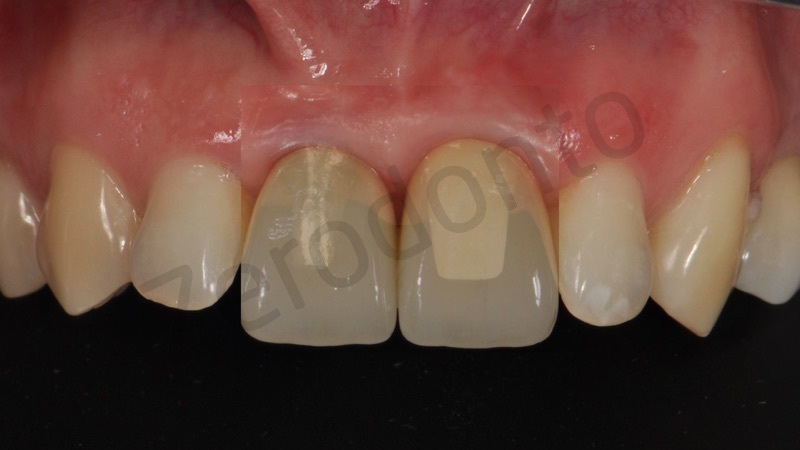 Provisional crown was attached to the adjacent teeth. 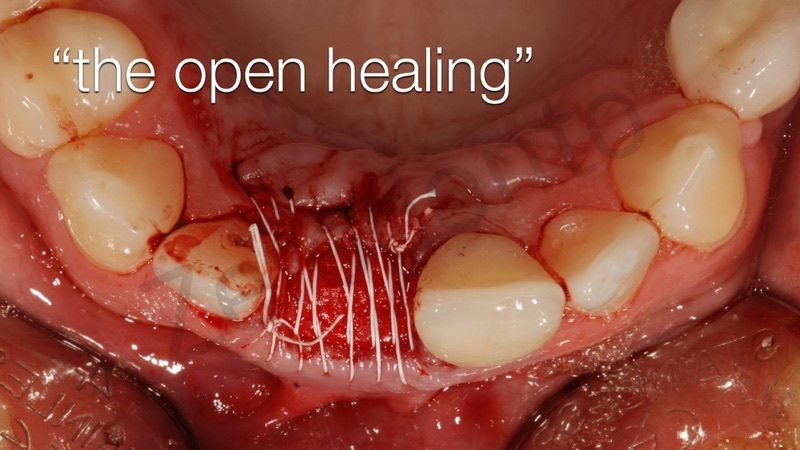 Rubber dam was used to protect the “open healing” site during adhesion procedure. Functional check was performed to respect the functional movements and avoid any interferences that can generate forces on the attached provisional. 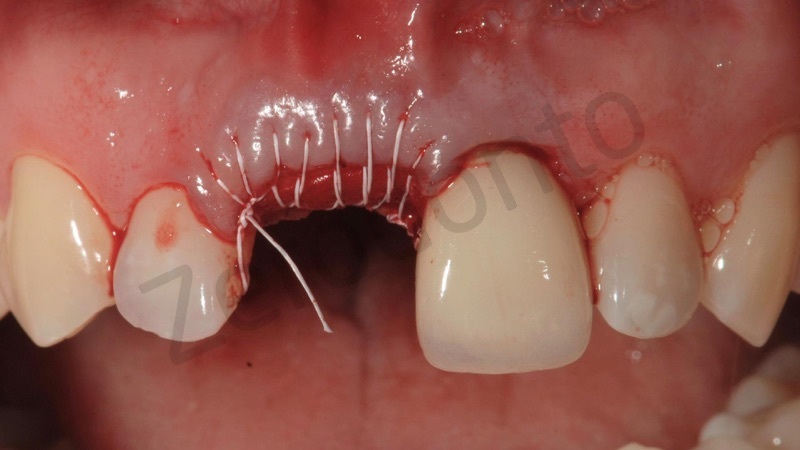 The patient received full instructions list for hygiene and self evaluation in case of a possible adhesion failure that could generate provisional crown’s movements that would affect the socket site. Sutures were removed after 3 weeks. 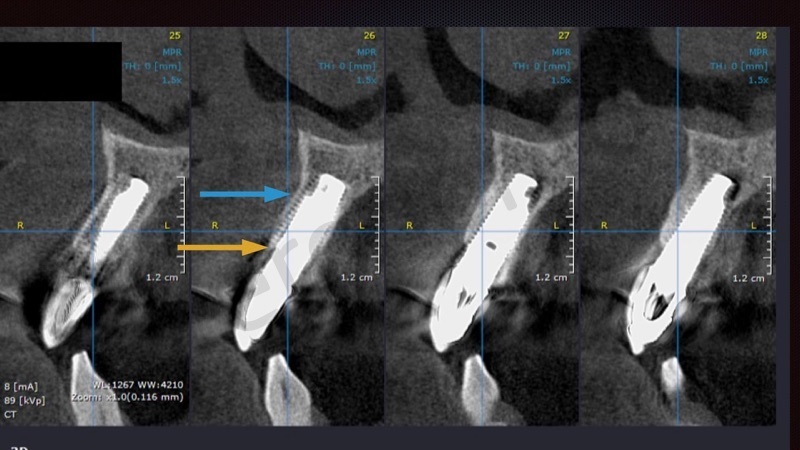 Control CBCT scan was performed after 6 month. 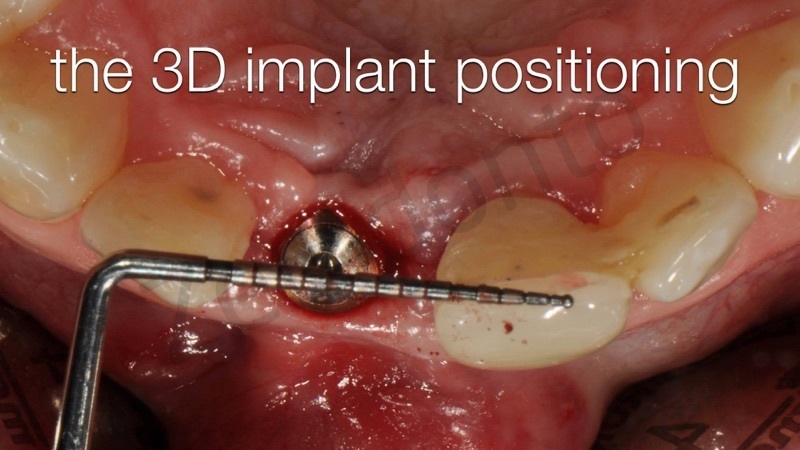 A soft tissue level implant (TRI Octa, Switzerland) was inserted flapless, respecting the implant 3D positioning for the ideal emergence profile of the future crown. Biological drilling was performed (150 RPM/ no irrigation). Primary stability was achieved with a torque of 40 NCm. 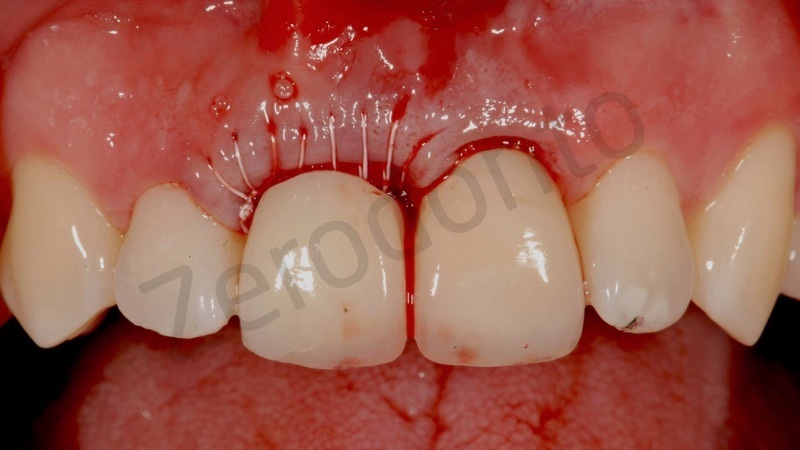 The provisional crown was once again attached to the adjacent teeth, with the same protocol described above. Patient was again informed on the maintenance strategy. 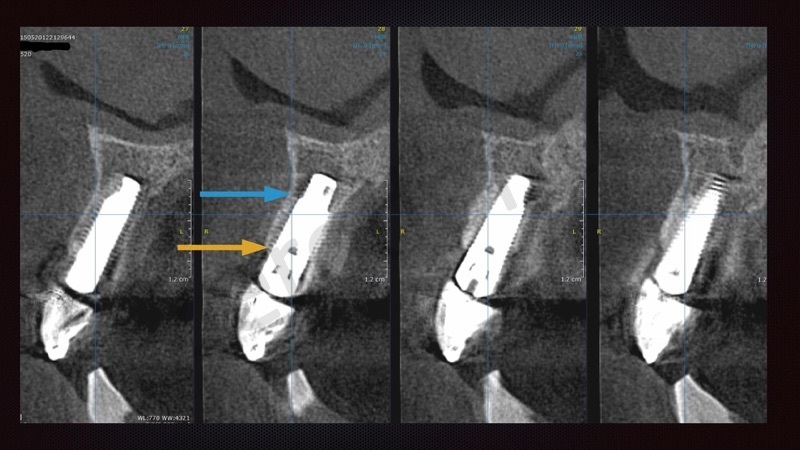 A new CBCT scan was performed 6 month after the implant placement. 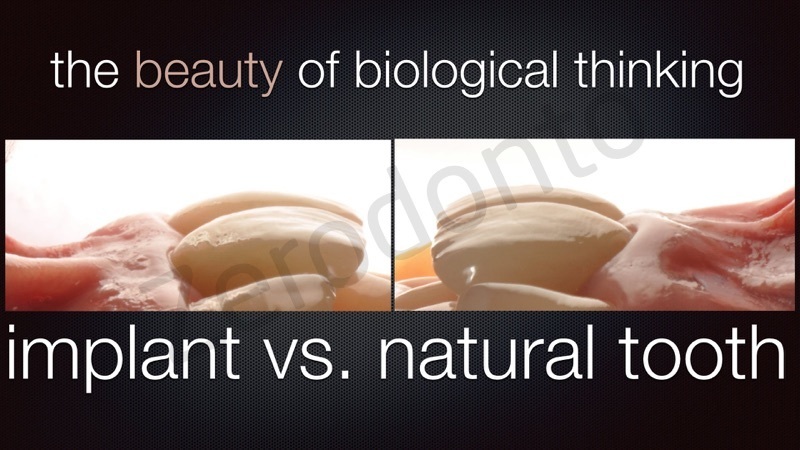 There was no bone loss observed compared to the pre implant scan. 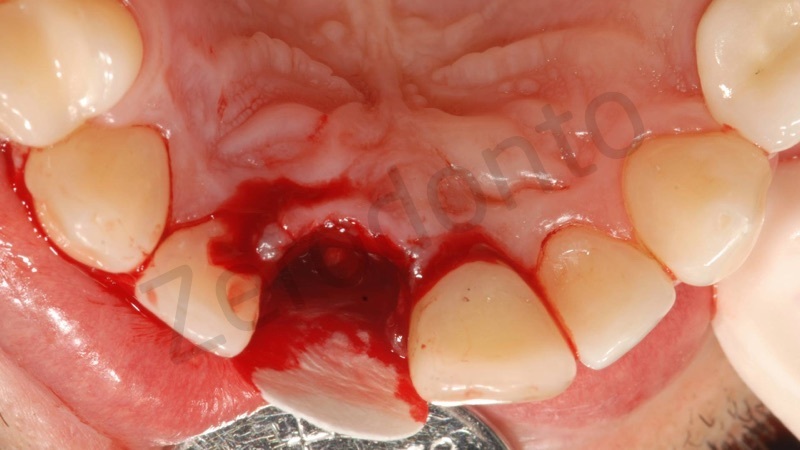 A solid abutment was fixed with a torque of 35 Ncm and prepared in situ. 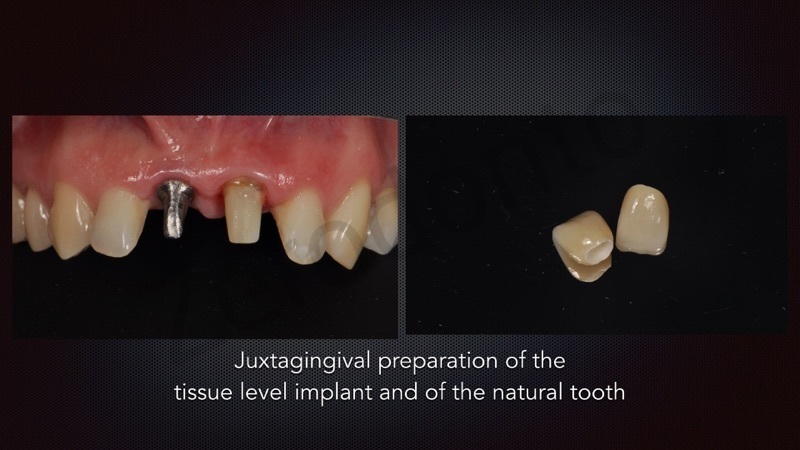 The preparation was juxtagingival for both 11 implant and 21 natural tooth. Impression was taken in analogic way (Express XT, 3M Espe). 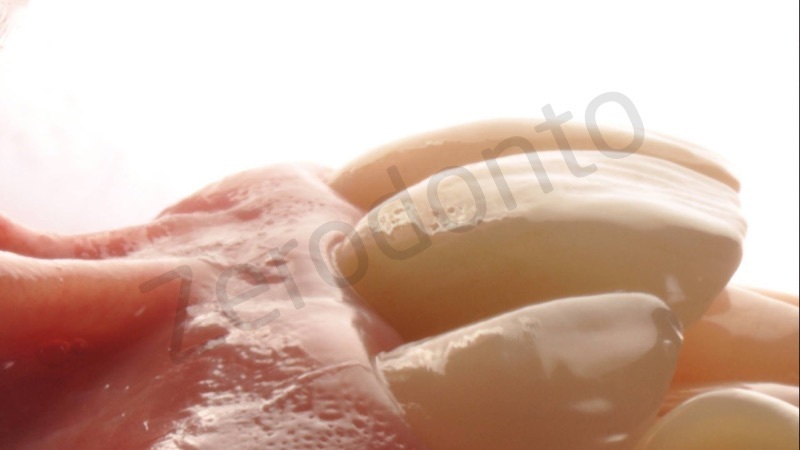 Ceramic on zirconia frame crowns were produced. 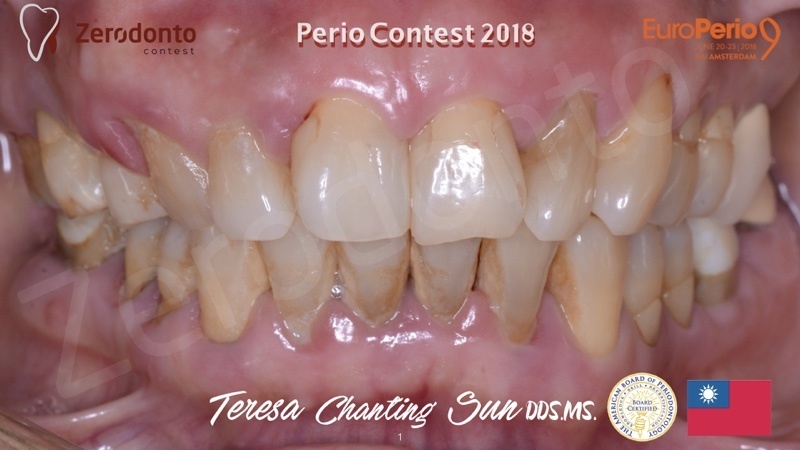 A specific indication regarding the exact positioning of the contact point between the two crowns was sent to the laboratory (Tarnow rule of 5mm was respected for biological papilla formation). The palatal design of the crowns is sustaining the anterior guidance. The crowns were cemented with Fuji Plus Capsules (GC, Japan). 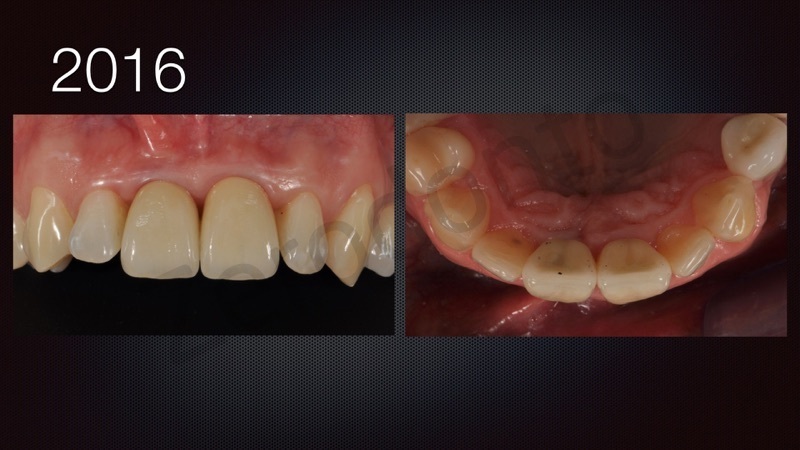 The solid titanium abutment was treated with Metal Primer (GC, Japan). 3 month, 6 month and 12 month follow ups revealed a stabile clinical and x Ray situation, with papilla formation. After 15 month, the patient came for a check up, claiming a new sport incident that caused a trauma in the same region. 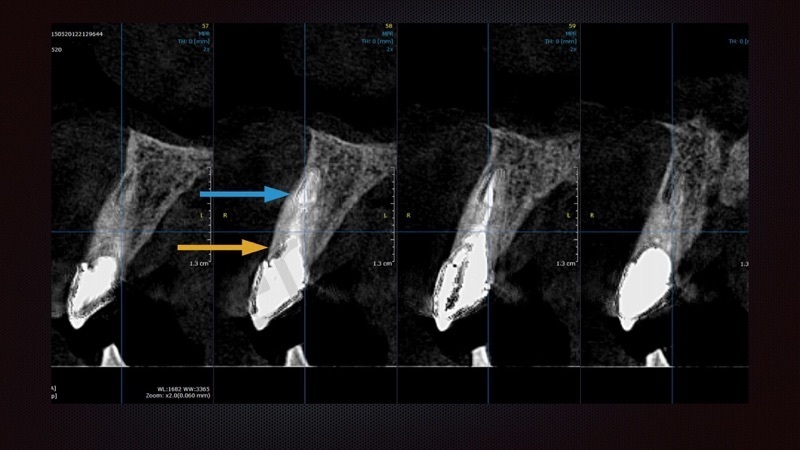 The CBCT scan revealed that the implant was not affected, but a root fracture at tooth 21was observed. The patient will receive a new surgical procedure at the site of 21. 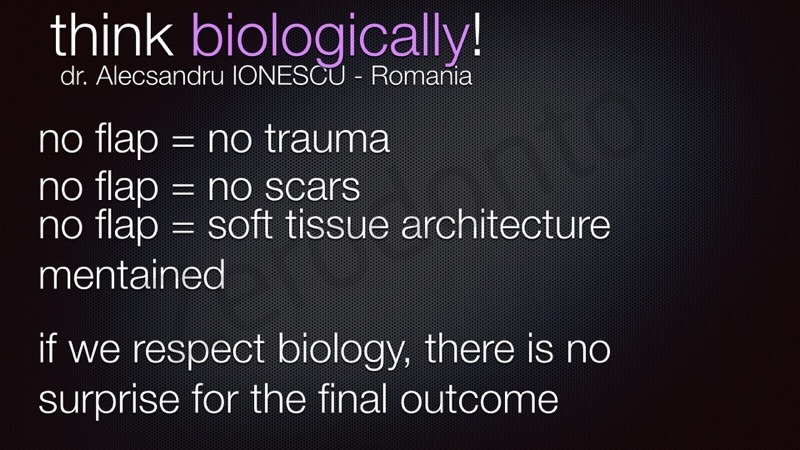 In an era of sophisticated techniques and materials, going back to understanding and respecting biology using a minimally invasive surgical approach, is a huge benefit for the patients in our everyday practice. Clinical and x-ray controls revealed long term stabile results, comparable with natural dentition, for both soft tissue and bone. Patient comfort is an added value to this concept, due to the lack of swelling, intra-op and post-op discomfort and no need for supplementary surgical interventions and soft tissue management.